Did you have a wonderful Thanksgiving with your family and friends? Good! My Thanksgiving was a wonderful combination of family and food. But now that the holiday is over, it’s time for the fun to start! Why do I like the weekend after Thanksgiving almost as much (maybe even more) than the big day itself? Because my fridge is FULL of leftovers begging to be turned into something wonderful. Here’s a secret about my family… other than my dad, we aren’t big fans of leftovers. Yes, I’ll take leftover soup, pasta, salad with me to work the next day for lunch, but my mom, sister, and I aren’t big on eating the same thing two nights in a row. So it has forced my mom to be creative in reusing leftovers over the years. One thing that we had a lot leftover of this year was roasted acorn squash. While my mom, The YIA and I love acorn squash, my dad and sister aren’t too keen on it. So with a lot leftover and two people who would rather not eat it, I needed to come up with something delicious! 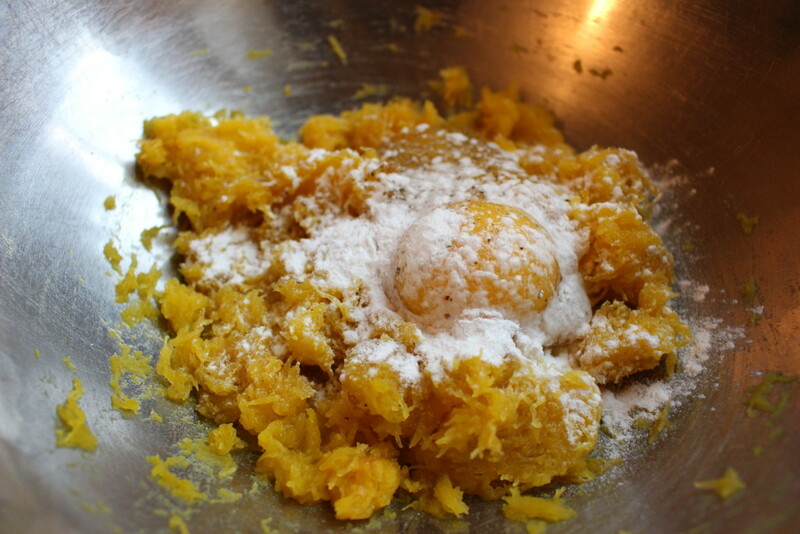 And Acorn Squash Fritters were born. They have all the delicious squash flavor but in a crowd-pleasing form. 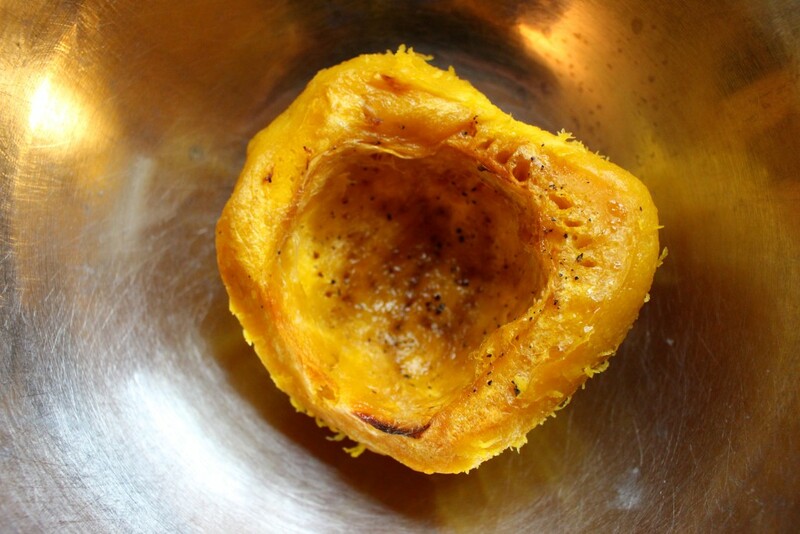 It starts with some leftover roasted acorn squash. 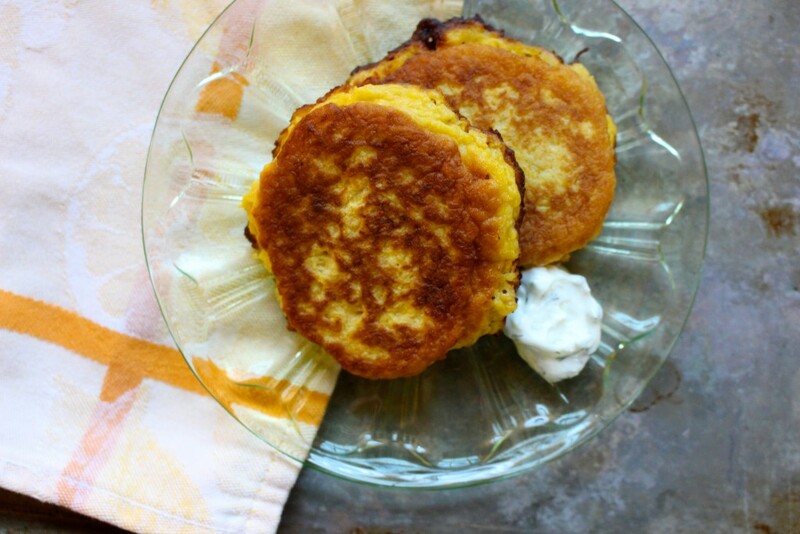 If you don’t have any squash leftover, you can roast some up just for the fritters. Halve a medium-sized acorn squash and scoop out the seeds. Brush the cut side of the squash with some olive oil and sprinkle with kosher salt, black pepper, and some brown sugar. Roast in a 400 degree oven for 45-60 minutes or until the squash is fork tender. Let it cool slightly before removing the flesh from the skin. 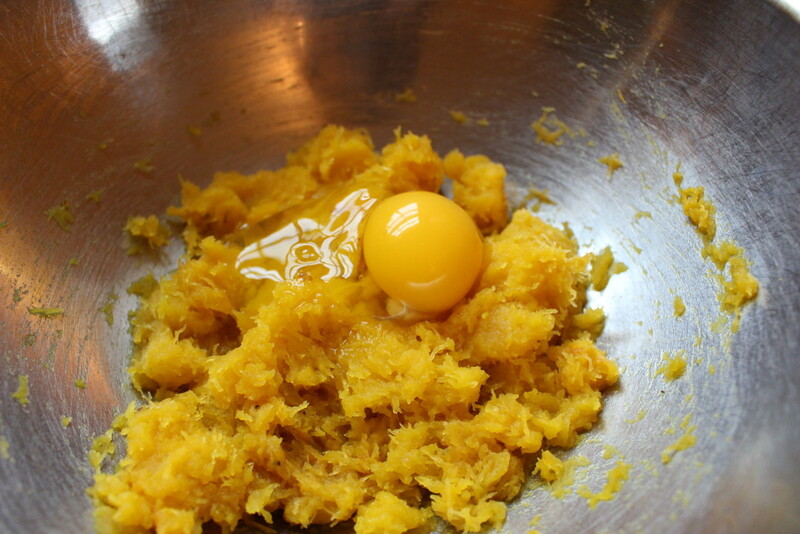 Mash up the squash with a fork. I like to leave a bit of texture in the squash. And then some salt, pepper, and baking powder and stir to combine. The baking powder helps the fritters rise slightly. 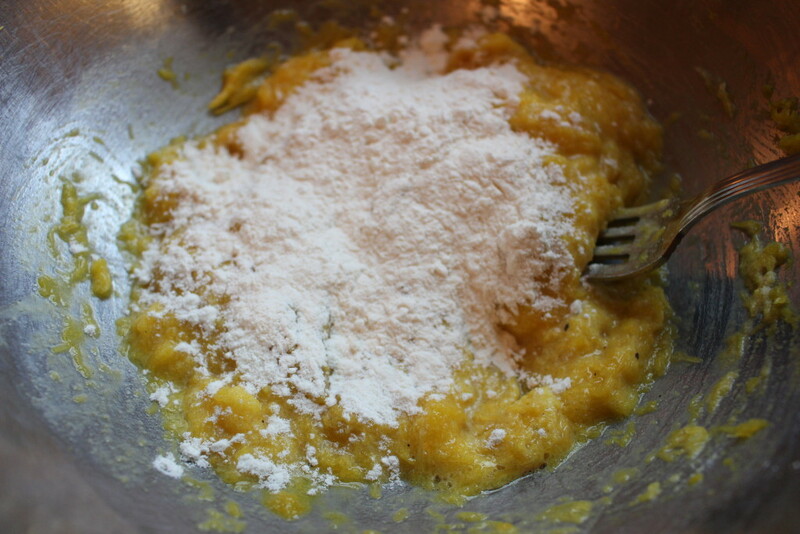 Then sprinkle over some flour and gently mix together with a fork. When the batter just comes together, stop mixing and pop the bowl into the fridge as the oil comes to temperature. I pan-fried the acorn squash fritters in a little bit of canola oil – just enough to barely put a layer on the bottom of a skillet. Cook the fritters for 1-2 minutes per side or until golden brown. Then flip and cook for another 1-2 minutes. A word of warning… THIS IS HOT OIL, SO PLEASE, PLEASE BE CAREFUL. If you have small kids or pets running around, I would wait to fry these up until the kiddos are safely away from the stove. After all the fritters have been made, it’s time to eat! I served them up with a side of faux-ziki – basically Greek tzatziki without the grated cucumber. It adds a nice tangy bite to the sweet fritters. And who said that Thanksgiving leftovers had to be boring? So, kiddos, what’s your favorite way to use up Thanksgiving leftovers? Let me know! In a large bowl, add in the roasted acorn squash. 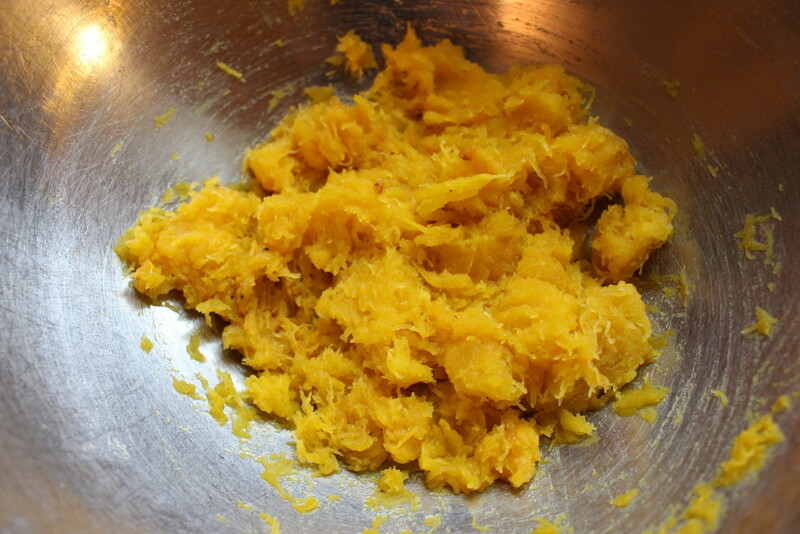 Mash the squash with a fork to desired consistency – I like mine almost smooth but with a few small chunks. Add in the egg, salt, pepper, and baking powder. Stir to combine. Add in the flour and combine gently until batter just comes together. Pop the bowl into the fridge as the oil comes to temperature. In a skillet with high sides set over medium heat, pour in just enough vegetable oil to barely coat the surface. 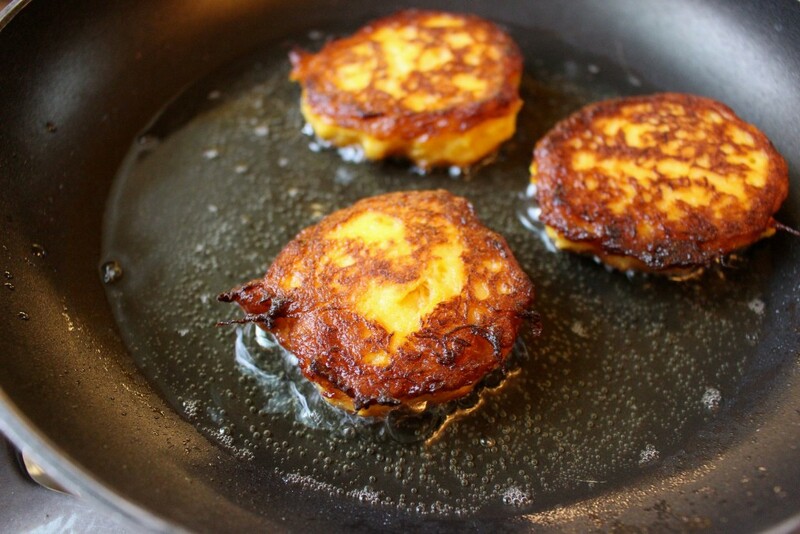 When the oil starts to glisten, portion out heaping tablespoons of batter into the skillet to form the fritters. Cook the fritters for 1-2 minutes per side or until golden brown. Carefully flip the fritters over and cook for an additional 1-2 minutes. A word of warning… THIS IS HOT OIL, SO PLEASE, PLEASE BE CAREFUL. If you have small kids or pets running around, I would wait to fry these up until the kiddos are safely away from the stove. 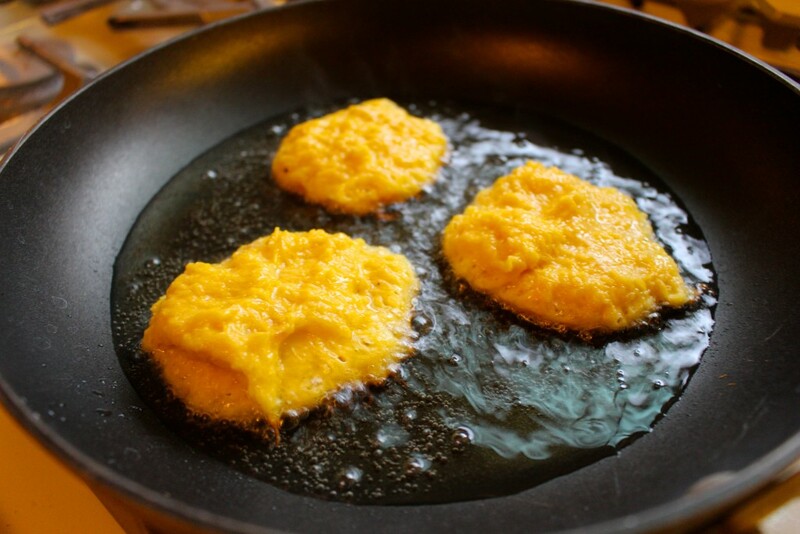 Remove the cooked fritters from the oil onto a paper towel-lined plate to drain off any excess grease. Finish cooking the remaining fritters. To make the sauce – combine all sauce ingredients in a small bowl. Mix to combine. Serve the fritters with the sauce. Enjoy!